Aging brings about several physiological changes in the body. This means that these changes are not due to any disease but just a normal consequence of advancing age. One such change is the loss of muscle mass. Although this can happen at any time in life, particularly with malnutrition and physical inactivity, it is somewhat inevitable for the elderly for several age-related reasons. The medical term for this gradual loss of muscle mass is sarcopenia. There is a greater focus on age-related conditions such as sarcopenia in geriatric medicine as people are now living longer particularly in industrialized nations and these changes in the body has a significant impact on the quality of life. 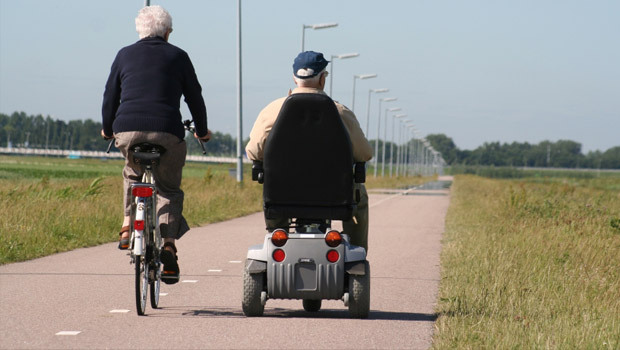 The elderly therefore need to be aware of sarcopenia, the ways in which it can increase the risk of injuries such as falls and how it may eventually reduce their independence to function without a caregiver. However, this loss of muscle mass can be slowed down as newer research reveals simple measures to maintain muscle bulk and strength. It is important to remember that while a more sedentary lifestyle in the senior years is a major contributing factor to sarcopenia, there are several other reasons for this loss of muscle mass. It is a combination of dietary change with age, absorption of nutrients from the gut, changes in the way the muscle cells respond to hormonal signals and failure of mechanisms that repair and grow muscle cells. However, a combination of diet and exercise can help slow down the muscle loss with age. Poor nutrition is a common occurrence in the senior years. Advancing age reduces the appetite and this may be further exacerbated by underlying chronic diseases or medication use. Sometimes economic factors in the retirement years also contribute to poor dietary habits. However, a significant factor with regards to inadequate nutrition among the elderly revolves around ignorance and the misconceptions that poor eating habits like a tea and toast diet will be sufficient to maintain health. Protein is essential to maintain muscle mass. Therefore a protein-rich diet provides the body with the materials needed to build muscle proteins. The protein intake does not need to be excessive and according to research, just a moderate serving of protein-rich foods is sufficient to achieve this effect. Meat is one of the major sources of protein but even for vegetarians or the elderly who cannot tolerate meat, protein rich dietary supplements may prove to be a viable dietary option. Dietary modification should also be accompanied by appropriate physical activity. It is this activity that serves as the stimulus for the formation of muscle fibers and subsequently increases the muscle mass and prevent further loss. The exercise regimen should be decided in conjunction with a doctor and physical therapist specializing in geriatric medicine to ensure that the body can handle the activity and to avoid injuries. Cardiovascular and moderate weight-bearing exercise should be combined, although each type of workout has both components to some degree. The exercise needs to be regular and in a minimum of 15 minute increments per session. One should be aware of individual limitations and discontinue any exercise once symptoms like chest pain, dizziness and shortness of breath arise. Muscle loss with age is most prominent in the lower extremities and therefore greater effort should be focused on this part of the body.